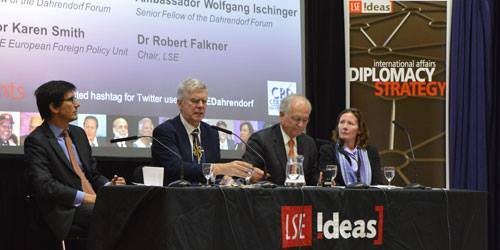 On October 8 the Dahrendorf Senior Fellows discussed the current security crisis and potential cooperation with Russia with policy experts and the LSE community. You can listen to the full podcast here. Ambassador Ischinger and Sir Robert Cooper, Dahrendorf Senior Fellows at the Hertie School LSE IDEAS respectively, are currently also involved with the OSCE Panel of Eminent Persons on European Security. The Panel is preparing the basis for an inclusive and constructive security dialogue across the Euro-Atlantic and Eurasian regions, reflecting on how to re-build trust among OSCE member States, and examining perceived threats in the OSCE area and potential common solutions. The 8th October discussions in London were very much defined by this outlook, searching for avenues of cooperation with Russia and ways out of the deadlock. The full day of events centered on the following questions: What are the limits of the institutions that are supposed to provide security for Europe? How can these be overcome in a sustainable manner? How can parties reach out to each other during a break down of trust? The first part of the day witnessed a roundtable discussion on ‘Europe’s Security Crisis and the Role of Arms Control Talks in Building Confidence’ hosted by the Royal United Services Institute (RUSI). It gave the Senior Fellows the opportunity to discuss possible strategies of initiating a sustainable collaboration and a security framework in Europe with London-based experts. In the evening, Ambassador Ischinger and Sir Robert discussed with Professor Karen Smith (LSE) the current developments in Ukraine in a public lecture that engaged over 400 people. The speakers highlighted the successes of diplomacy which established the post Cold War order through the Helsinki accords and the power of EU integration and enlargement to bring peace to the European continent. While both Senior Fellows highlighted the constructive collaboration with Russia on the recent Iran nuclear deal, Sir Robert Cooper did underline that the trust with Russia is currently as ‘low as it can be’. The lack of collaboration with Russia on Ukraine was described as very worrisome by both Senior Fellows. They both agreed that a step-by-step approach on specific issues may be the only first way out of the stalemate. Ambassador Ischinger expressed concern about the possibility of unintended escalations and the current missing institutional set up if no collaboration was initiated as soon as possible. Russia has contested the post-Cold War territorial settlement in Europe in the past decade, which it appeared to tolerate over the 1990s. Professor Karen Smith and the audience challenged the speakers on the role of the EU and NATO enlargement in the creation of this conflict. Sir Robert Cooper emphasised specifically the importance of this expansion of the EU to bring collaboration and economic ties with eventually bring change and peace among neighbours. Ambassador Wolfgang Ischinger stressed the importance of never underestimating the power of continued communication during an ongoing conflict, even if issues appear ‘unresolvable’. He suggested it is worth considering the approach of the German politician Egon Bahr. The creator of what came to be Germany’s Ostpolitik enabled the co-existence of two Germanies without recognition during the Cold War. As the Cold War walls in Europe have been overcome, Amb. Ischinger was adamant on not letting new walls reappear today. The theme of the future of the OSCE remerged several times during the talk. Both Senior Fellows agued for a revaluation of the three OSCE baskets (political, economic and human dimension) to reflect both the new Eurasian geopolitical realities and the technological advancement which affect both security and civil liberties today. The question remains how this can be reached, to what extend this will be done on Russia’s terms, and within its contestation of the current European order.